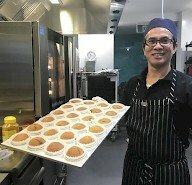 Operating as part of Wests Ashfield Leagues Club community program, Wests Kids chefs work onsite at The Infants’ Home to provide delicious, nutritious morning tea, lunch and afternoon tea for up to 300 children daily. The children are loving all the new varieties and flavours each day, and educators have pointed out that you can really see the quality in all the fresh and healthy ingredients. 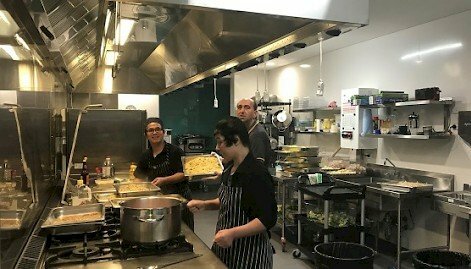 Importantly, the chefs are able to cater to children with food allergies and those with special nutritional needs to ensure that children in all our centres, in all age groups can enjoy their catering. Feedback from our 5 early childhood education and care centres is all positive. The children love the smell and taste of their fresh meals, and the staff also love sampling the new menu. Johnson House Toddlers have continued their musical learning adventures, engaging in dancing with bells to an action CD called “Let’s Have A Party”. The children were very confident as they moved to the music and kept the beat with the bells, and were surprised at the loud sounds the bells made when they shook them very quickly. Educators plan to continue to offer the children music experiences to explore loud and soft sounds. 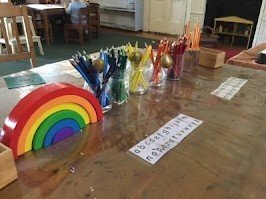 At Johnson House Preschool, the drawing space has been set up with a range of writing materials to suit the various capabilities and abilities of the children. Offering such materials helps to build on the children’s skills in terms of fine motor control, pencil grasp and pre-writing skills. A selection of chalkboards and various sized chalks has also been provided, allowing for children’s skills to be enhanced with a different medium. Educators have been working closely with the children to help refine their skills and build their confidence in this space. At Murray House Infants, the children are very interested in farm animals. Educators have provided a felt board with felt animals, using it to retell one of the children’s favourite songs, Old McDonald had a farm. The children particularly enjoyed mimicking the sounds of the animals, naming the animals and having discussions about the animals’ appearance. This experience facilitated visual literacy, language, and motor skills. 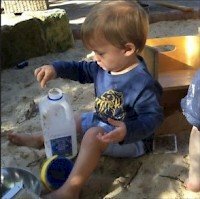 At Murray House Infants, children have been using egg cartons, milk bottles and other resources for cooking experiences in the sandpit. Educators provided picture recipes, to integrate visual literacy into the experience and support children to develop meaning during the play. The children were dramatising familiar experiences and drawing their experiences with families in their play. Rigby House was reopened only a few weeks ago following renovations, and children are already displaying comfort and security in their Rigby environment. Educators have enjoyed seeing the children demonstrate their self-help skills during meal times. As they hold their fork or spoon, they practice their large and small motor skills. They gain confidence in their ability to try new flavours and build their self-esteem and pride in their independence as they help with cleaning up afterwards. Rigby children have been getting involved in gardening. 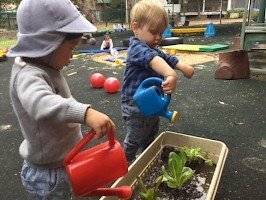 After watching seeds germinate, they have been caring for the young seedlings and plants that have been planted in various pots and garden beds. The children enjoyed the opportunity to explore living things, and to notice and respond to the changes they saw. This activity helps the children to gain an appreciation for the natural environment and learn about the interdependence of living things. Staff would like to thank all the parents who donated seeds, plants, and pots for the children to enjoy and learn about plants and seeds. Harmony Day was celebrated at Robinson House this month, with many discussions about diversity and the ways that we can respect people who are different to ourselves. The Robinson House program always includes aims of supporting children to develop cultural competency, and respect diversity. On harmony day (March 21), educators capitalised on the opportunity to engage in conversations with children about these concepts. 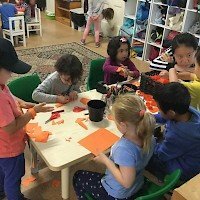 As the children used orange paper to create something to wear, they learned that harmony day is about celebrating and respecting difference, and that everyone belongs. The experience not only broadened the children’s understanding of the world in which they live but also enhanced their language and fine motor skills. A squish and a squelch and a stomp! Little Elephants FDC provided a great sensory experience of dinosaur stomping and printing. The children explored colour and the sensory experience of squishing paint between little fingers. Educator Anna used the children’s interests in dinosaurs to support their explorations. An educator in St George, Estela, has been sourcing materials from her local community and environment to challenge the children’s learning and curiosity. 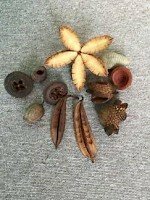 This week Estela sourced gumnut shells from a friend, found a camellia branch in the garden, and her neighbours gave her some palm branches. Finding her own collection of shells and discovering some beautiful banksias at the local markets allowed Estela to create a beautiful nature box for the children to explore. Adding this small box to the learning environment provided a wonderful opportunity for the children to explore a range of natural materials that can be found in the children’s own environments, and inspired wonderful conversations about how to care for the world they live in.